Dr. Ralph Opacic (founder and director of Orange County School of the Arts) gives us a big thumbs up for Festival of Children’s Foundation! Meet Shira Strongin– a 17-year-old living with several rare conditions. She is the founder and chairwoman of We Are More, a charity that works to raise awareness and empower young people living with chronic illnesses. With every turn of the King Arthur Carousel at the Disneyland Resort, Strongin and her charity are one step closer to making their dream of supporting other young people living with rare and life threatening illnesses– just like hers– come true! 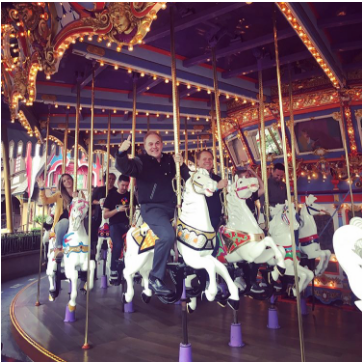 On Nov. 15, teams of charities came to the Disneyland Resort to participate in the annual Carousel of Possible Dreams, hosted by the Festival of Children’s Foundation (FoCF). The teams represent donors to the FoCF, such as schools, companies, and businesses. Participants rode the King Arthur Carousel to raise money for charities supporting children in need. Founded in 2009, the Carousel of Possible Dreams event, hosted by the FoCF, is an annual event in which participants raise money by riding a carousel 50 times. The FoCF then puts these donations towards the network of participating organizations. The Carousel of Possible Dreams is one of FoCF’s signature events, which occurs in Chicago, the Disneyland Resort, and recently expanded to a carousel in San Francisco. This year, groups of all ages such as Strongin’s foundation We Are More and staff members from Orange County School of the Arts (OCSA)/California School of the Arts and San Gabriel Valley (CSArts-SGV) raised over $210,000! Although the event is quite the dizzying feat, it sure is a magical experience!